Swaminarayan Akshardham in New Delhi epitomizes 10,000 years of Indian culture in all its breathtaking grandeur, beauty, wisdom an d bliss. 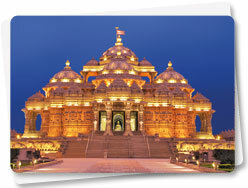 It brilliantly showcases the essence of India’s ancient architecture, traditions and timeless spiritual messages. The Akshardham experience is an enlightening journey through India’s glorious art, values and contributions for the progress, happiness and harmony of mankind. The Swaminarayan Akshardham complex was built in only five years through the blessings of HDH Pramukh Swami Maharaj of the Bochasanwasi Shri Akshar Purushottam Swaminarayan Sanstha (BAPS) and the colossal devotional efforts of 11,000 artisans and thousands of BAPS volunteers. Heralded by the Guinness World Record as the World’s Largest Comprehensive Hindu Temple, the complex was inaugurated on 6 November, 2005. A hallowed spiritual tradition in which prayers are offered for world peace and continual peace for oneself, family, and friends with the water of 151 holy rivers, lakes and ponds of India. Experience enduring human values through films and robotic shows that depict the ideals of nonviolence, honesty, family harmony, and spirituality. Discover India through the incredible story of an eleven-year-old yogi named Nilkanth that brings to life the culture and spirituality of India's customs, the majesty of its art and architecture, and the unforgettable sights, sounds, and power of its awe-inspiring festivals. Sail through 10,000 years of India's glorious heritage. Learn about the discoveries and inventions of the rishi-scientists of India, see the world’s first university of Takshashila, sail through the caves of Ajanta-Ellora and discover India's contributions to humanity through the ages. A spectacular musical fountain show that depicts the cycle of birth, life, and death as described in Indian philosophy. Sixty acres of lush lawns, gardens and exquisite bronze statues, honouring India's child heroes, valorous warriors, national patriots and great women personalities who inspire values and character. Copyright © Delhi Tourism, All Rights Reserved.